You use the selection tool in Blend to select and object on the artboard so that you can then modify the object by changing its properties. To activate the selection tool, click on the top icon in the tools panel (an arrow), or press the “V” key. 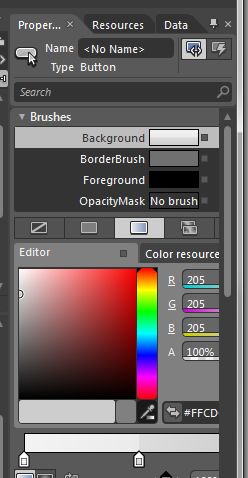 With the selection tool active, you can now left-click to select an individual object on the artboard. The object will change to show a blue border, indicating that it is selected. 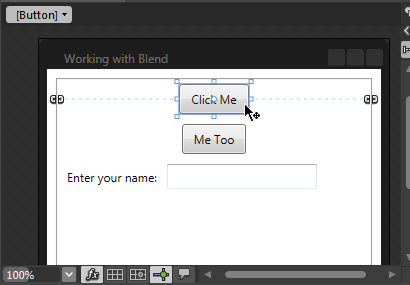 In the example below, we’ve left-clicked on the button labeled “Click Me”. Once you’ve selected a particular object, you’ll see its properties listed in the Properties panel (normally on the right side of the screen).